A bombed out building in Ghouta. A HUMANITARIAN “PAUSE” announced by Russia in Syria’s deadly bombardment of Eastern Ghouta took effect this morning, offering a short window for the enclave’s traumatised residents to emerge from their basements. The daily five-hour respite, which began at 9am, was announced by Russia under pressure from international powers anxious to stop more than a week of air strikes, artillery fire and rockets that killed more than 500 people. Moscow said it would allow some of the nearly 400,000 people living in the rebel-held area to leave the battered enclave through safe corridors. 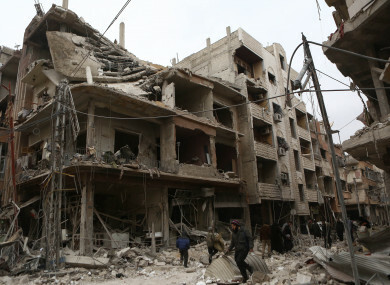 Russia hinted regime forces had not ruled out targeting certain areas or groups. Rocket fire was reported at least once after the start of the truce but no major breaches were immediately recorded. A spokesman for the UN’s Office for the Coordination of Humanitarian Affairs in Geneva said it was not yet clear when aid could be sent in. “We cannot send people on a convoy in any area on the promises of whomever. We have to see a ceasefire actually taking place on the ground” before aid trucks can be deployed, Jens Laerke told AFP. The “pause” falls short of the month-long ceasefire the United Nations had supported in a bid to stop one of the bloodiest assaults in Syria’s seven-year-old conflict. “Five hours is better than no hours, but we would like to see an end to all hostilities extended by 30 days, as stipulated by the Security Council,” UN spokesman Stephane Dujarric said. According to the Syrian Observatory for Human Rights monitoring group, more than 550 civilians – almost a quarter of them children – were killed in nine days of bombardment. Rockets and shells fired from the enclave — which lies within mortar range of central Damascus and is controlled by Islamist and jihadist groups — have also claimed around 20 lives in regime-controlled areas in recent days. Residents in the enclave were relieved to have some respite from the bombs that have rained on their homes since February 18, but many remained defiant and reluctant to leave the enclave. Some residents left the basements they had been cowering in for days to check on their property and buy food despite skyrocketing prices in the enclave, besieged since 2013. “This Russian truce is a farce. Russia is killing us and bombing us every day,” said Samer al-Buaidhani, a 25-year-old resident of Douma, which is the main town in Eastern Ghouta. “I don’t believe it’s safe for me or my family to leave by this system,” he told AFP, when asked about the Russian pledge to open humanitarian corridors. A statement by Russia’s Centre for Reconciliation of Opposing Sides in Syria said the decision to enforce a “humanitarian pause” was made jointly with Damascus. “The Syrian government forces will cease combat actions against terrorists during this pause,” it said, adding however that the measure was effective only in certain areas of Eastern Ghouta. “The required number of buses and ambulance cars has been prepared” at a checkpoint to evacuate the sick and wounded, said the statement by the centre, a Russian body monitoring humanitarian efforts and peace initiatives in Syria. According to the United Nations more than 700 people need urgent medical evacuation from Eastern Ghouta. Syrian state television aired live footage of the checkpoint area but no civilians could be seen boarding the waiting buses. In Hammuriyeh, another town in the sprawling semi-rural enclave, Mohammed Abdullah said the pause left civilians with a choice between two evils. “The truce is not in the people’s interest, we have two options: death or displacement,” said the 30-year-old. “The campaign we were targeted with was an extermination campaign, not a simple bombardment. What we want is a full and permanent ceasefire for all of Ghouta,” he said. The scenario put in place by the regime and its Russian ally was reminiscent of the deal that saw civilians bused out of the northern city of Aleppo in late 2016. Email “'We have two options: death or displacement'”. Feedback on “'We have two options: death or displacement'”.